When encouraging those in the beef industry to make changes to improve animal well-being, measured outcomes can provide the reason why. MANHATTAN, Kan. (May 21, 2010) — Dan Thomson, professor and director of the Beef Cattle Institute at Kansas State University, posed the question, “Why do we need to measure outcomes?” as he addressed the International Symposium on Beef Cattle Welfare May 20 on the campus of Kansas State University. "We need to be a more proactive industry," Dan Thomson says. "We've got to define what normal is so we know what abnormal is." Thomson replied, “Because when you are asking people to make changes, they are going to ask ‘Why?’” Having measured outcomes can give a basis for the animal well-being recommendations that are made. Additionally, Thomson emphasized that when making recommendations for animal well-being and animal husbandry, consideration needs to be given to what producers are being asked to implement. “There is a practical application that has to be met,” he stated. Looking to the future, Thomson also talked about some of the shifts in thinking that may be necessary. Expanding on that thought, Thomson said in his view producer groups know what’s best. “I don’t think government regulation is the way to go," he said. "SOPs and assessment tools and third-party audits can be an effective system for ensuring animal well-being practices are implemented.” He suggested this may be an ideal role for rural practitioners because they know the producers. 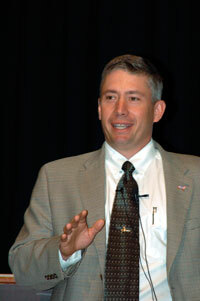 Another shift that Thomson indicated the industry may need to adapt is beef quality audits and where they occur. “The audits used to be about physical qualities of the meat. Now animal handling and herd management are moving up in importance on that list. Maybe we need to start doing a feeder calf audit for animal well-being. That’s a shift,” Thomson said. Thomson highlighted an online training center focused on animal care that K-State has initiated at www.animalcaretraining.com. The site offers 200 modules in Spanish and English on beef, dairy and equine animal care, behavior and handling topics. Eight of the modules are specifically designed as training for livestock auction market employees with a post test at the end. Thomson emphasized how tools such as this can help ensure proper animal well-being training and documentation of that training to help implement a proactive change in the beef industry. He then challenged the industry to pick two or three issues and improve them. As an example, he pointed how the industry focused on injection-site lesions several years ago and was able to greatly reduce the problem.